PANJIM: Goan triathletes Nisha Madgavkar and Nicole Pavri won first places in the 6th Thonnur Triathlon held near Mysuru, recently. Both women triathletes were part of an eight-member team from Goa which dominated the event with a total of three podium finishes. 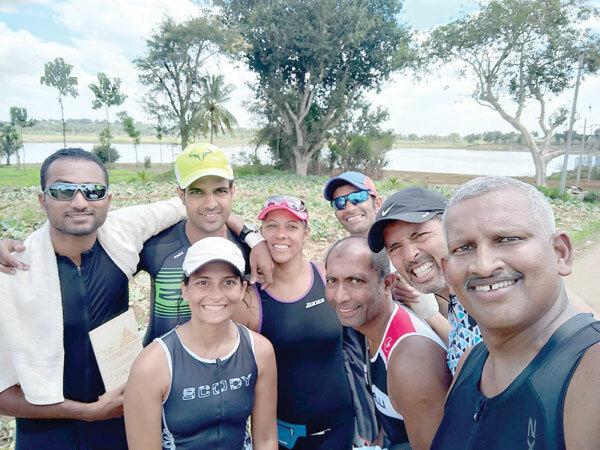 Nisha Madgavkar, Goa’s most experienced triathlete came first overall beating back both men and women in the Olympic distance triathlon (1.5km lake swim + 40 kms cycling + 10 kms run) with a timing of 3:00:35 hours. Nicole Pavri won the women’s sprint category (50 metres lake swim + 20 km cycling + 5 km run) in a timing of 1:45: 33 hours. Likewise, Zubin Rebello stood second in the men’s U-30 age group, sprint triathlon category clocking an impressive 1:40:22 hours. Among the other Goan triathletes who participated in the Olympic distance triathlon, Vinayak Gaonkar finished fourth in 3:21:53 despite suffering two tyre punctures; Wilbert Egipsy, seventh in 3:27:13; Rahul Chandawarkar, 16th in 3:42:13 and Bhagwant Lotlikar, 35th in 4:06:45 hours, while Agnelo D’Sa completed the sprint triathlon in 2:20:32 hours.